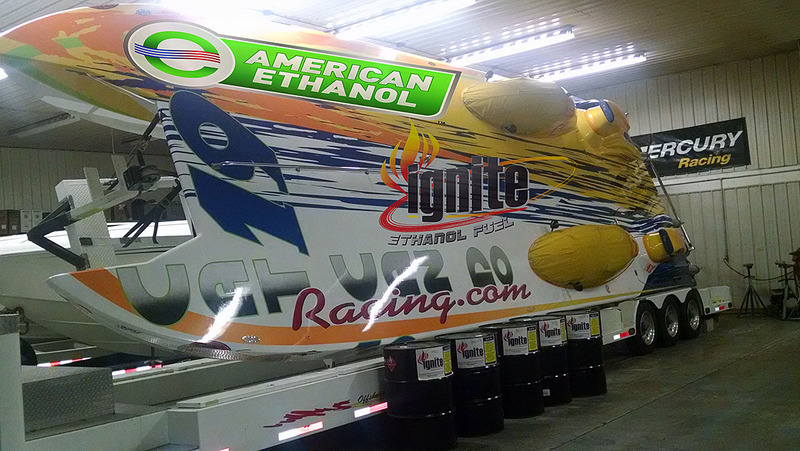 This season the Ignite American Ethanol Cat is planning to run races in both OPA and SBI as well as participate in a couple of top-speed shootout events. Building upon last season’s relationship, the CK Motorsports-backed Cat Can Do offshore racing team is beyond excited to bring on Ignite Racing Fuels and American Ethanol as the primary sponsors of the Douglas Marine-built Skater Powerboats catamaran, which took home the 2015 Offshore Powerboat Association Extreme class national and world championships. According to CK Motorsports owner Keith Holmes, the throttleman of the Cat Can Do Skater that will be referred to as the Ignite American Ethanol Cat with the added catchphrase “Cat Can Do,” said the team is going to proudly display the American Ethanol neon green banner and the Ignite Ethanol Fuel logo on the 40-footer. The boat is expected to make its season debut at Lake Race on Missouri’s Lake of the Ozarks in early June. And while the team’s 2016 schedule isn’t finalized, Holmes said there are going to be surprise showings in the racing, event and shootout circuits. “With help from Jay Berry of Ignite, who is spearheading an initiative to hand pick different people in different racing fields to represent ethanol fuels, we feel like we can build off last year’s momentum and put more energy into informing the public about ethanol,” said Holmes, who signed on as an Ignite Racing Fuels dealer after becoming more educated on the product and having success with the fuel in his team’s Sterling Performance engines. “We’re very excited about the program and we’re looking forward to making people more aware of the benefits this renewed energy has to offer while trying to clear up some of the misconceptions people have. Keith Holmes and the Cat Can Do team are excited to have support from the companies behind the ethanol fuel that he said is absolutely safe and environmentally friendly. Holmes said upon further testing, it was clear that ethanol created better compression, boosted power, added torque and lowered engine temperatures. Last season the team modified its engines from running 116-octane race fuel and 20 pounds of boost—a formula that produced a little more than 1,500 hp and 1,200 foot-pounds of torque—to running E90 fuel and 15 pounds of boost. The transition increased the power output and produced an additional 225 foot-pounds of torque, all while saving on fuel costs. “So far the fuel is very friendly and forgiving to work with—it also produces impressive gains in horsepower and torque,” said Mike D’Anniballe, the owner of Sterling Performance in Milford Township, Mich., who added that he’s looking forward to the ongoing development of ethanol-burning engines. Berry, who pointed to several performance boaters who use ethanol fuel including Gary Smith, Don Onken and Kenny Mungle (of Gone Again Skater fame), said he prefers to let the high-profile drivers answer the questions about ethanol. Along with the Ignite support personnel who helped dial in the power, Holmes thanked Dan Schwartzkopf, Don Onken and Gary Smith for all of their support with the conversion. In closing, Holmes, who responded with an open letter to comments made to the Oil Price Information Service about the detrimental effects of ethanol in marine engines by the boating advocacy group BoatUS, said: “It’s time to stop the misinformation and scare tactics—it’s time for consumer choice, cleaner air and improved conservation efforts. That is what CK Motorsports believes in, because ethanol delivers.” You can read the entire letter here. Pingback: Адукацыя змяняе жыццё і ператварае эканоміку. Pingback: Εκπαίδευση αλλάζει ζωές και μετατρέπει τις οικονομίες.